– The crowds are insane, you can’t get close to her. – Ummmm What’s the big deal. After all that wait, and all these crowds, I’m a little underwhelmed. This last point has caused many people to question their tastes, If she’s the great masterpiece and I’m underwhelmed, then where does that leave me? Her’s what I think, because I know you’re dying to hear my opinion. Leonardo had a reputation for having a GREAT sense of humour – one more reason to like him – – – and feel inadequate beside him. 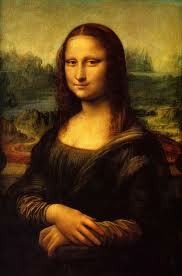 She’s called La Gioconda roughly translated – the one who laughs. Look again at this face. She’s NOT LAUGHING – so who’s laughing? 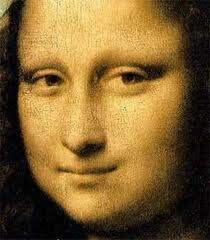 Leonardo was a superstar celebrity when he painted her. After she was finished he was know to carry her around with him. I wonder if people had to set an extra chair at the table. While he was still alive people were already asking “What is it with this painting?” They’re still asking that question. He created a buzz…and it worked. Over the years, she fell out of favour – even a Leonardo buzz can only last a couple of centuries. Eventually she’s hanging on the wall of the Louvre with a lot of other paintings. One more pretty face in a sea of pretty faces. THEN —– on August 21, 1911 she was stolen by an Italian Nationalist who thought the French had no right to have her. He took her to the Uffizi in Florence who promptly returned it to the Louvre – OK not so promptly, they toured her around Italy first. SUDDENLY Mona’s got her buzz back and she’s famous again. Let’s take a lesson from one of the great marketing geniuses of all time (one more reason to feel inadequate around Leonardo). Let’s LOVE the work we create. Enjoy it and talk about it. Start your own buzz, blow your own horn, LOVE your own masterpiece.